Now offered in powder coated white! The Stryker SG300 T-Top for center console boats is designed with the same custom style and rugged construction as Stryker's best selling folding T-top the SG600. Both models are designed to go toe-to-toe with any aftermarket, custom fabricated or OEM factory made t-top. Our t-tops are "universal" meaning the upright leg sections can be moved in or out to snugly fit the dimansions of your center console unit. Completing the install with the massive solid aluminum top clamps and included side supporting stand offs, you will have a rock solid, beefy t-top structure with no sway, wiggle or rattle. Capable of supporting hundreds of pounds, the SG300 offers the same durability and strength of custom and OEM-installed tops. The SG300 does not include welded mounting plates or a folding top. If you need mounting plates or a folding top for storage purposes, you will need our Stryker SG600 T-Top. Marine grade 316 stainless steel fasteners and pre-fabricated, pre-welded joints make the SG300 T-Top one of the stiffest and strongest universal T-Tops available. The T-Top is compatible with virtually every center console boat made in the past 50 years, and will fit over most any console up to 50" wide. 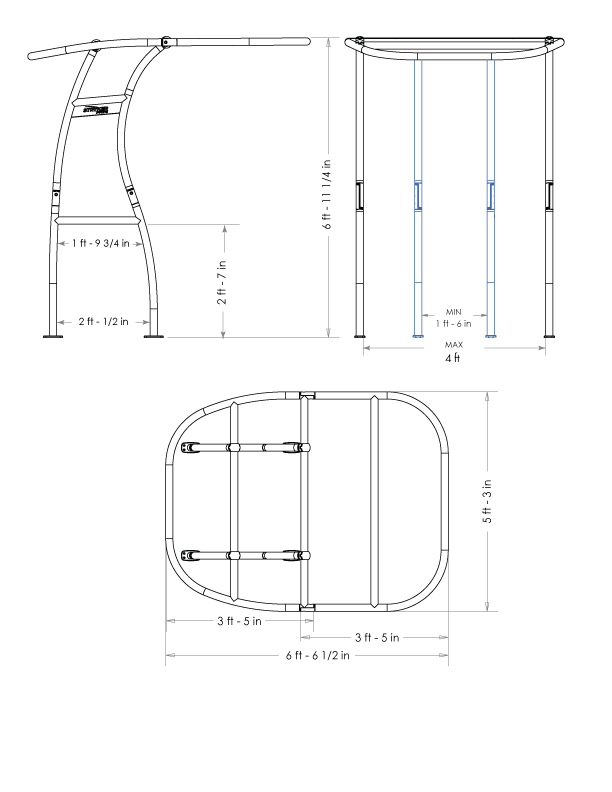 Standoffs in anodized aluminum(not powder coated black) are included and can be sized for any installation. 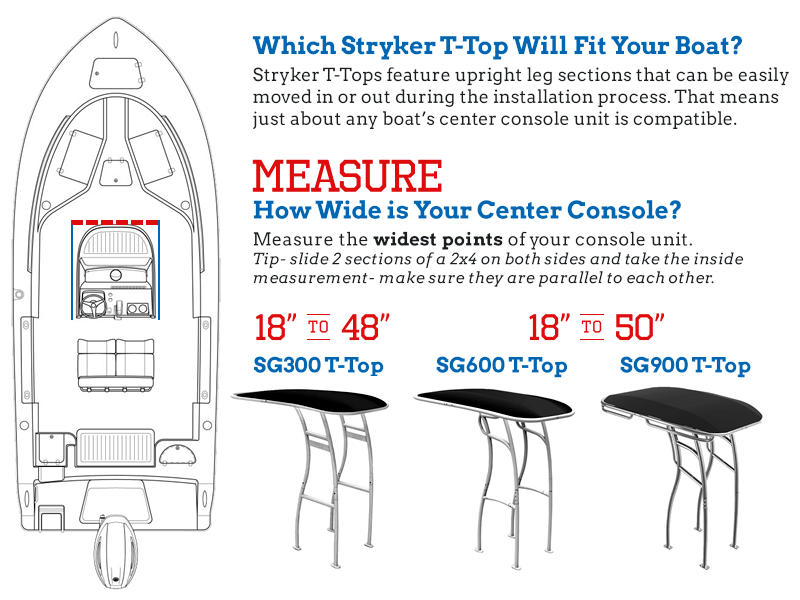 All Stryker T-Tops feature an adjustable, "universal" design meaning they will fit any boat with a center console! Even pontoon boat owners have installed our t-tops on their boat with no problem. Want to know if our t-tops will fit your boat? Just measure the width of your center console unit at the base where it meets the deck. If it's 18" to 48", the SG300 T-Top will fit. If it's 18" to 50", the SG600 folding t-top will fit. The price of our t-tops includes Sunbrella™ fade-resistant and stain-resistant canvas available in a variety of colors. You can choose 1 of ten standard colors or you can special order any color offered by Sunbrella™ for an additional fee(please call for details). Love the top, I get many compliments. The t-top provides great sun protection. The best part is that it is a great support for all to hang onto in rough seas or while motoring at high speeds. Even my boat dealer asked about where I got the t-top. Even my boat dealer asked about where I got the t-top. he said he wanted to hire me since the installation was good or better than his shop could have done. it supports 2 vhf antennas, a GPS pod, and 3 rocket launchers. It is very stable in rough water for a 19 foot boat. This T-Top really changed the look and feel of the boat. This T-Top really changed the look and feel of the boat. It is far superior to the bimini we previously had installed, and a great value. Many folks at the marina have commented on it. My new Styker T-Top totally upgraded the look and function of my boat. I get comments every time I am out on the water. This is a great product and I cannot recommend Stryker as a company high enough! I am very impressed with the quality of the t-top. I've added 4 rocket launchers and I have been very happy with the look and durability. I also purchased a mounting bracket for a new antenna. Right on!!!! It has changed my way of fishing. I thought the bimini Top would do the job, but, I need something more friendly and durable. This Stryker Top was my ultimate answer. No more wind problems or, in my case Sun protection. I am very happy with the end look and the easy installation. The Stryker T-top updated my old 1979 proline 20' boat to look as good as my neighbors brand new boats. Everyone says " about time you got a new boat".